Todo for iPad is a powerful task manager app that gives your a brilliantly designed interface that looks just like a folder of notes and works flawlessly, syncs with Mac iCal (tested), Windows Outlook, Remember the Milk and Toodledo. You can create Tasks and todos with a few taps, make them into projects, checklists, and even some really nifty types of tasks associated with calling someone, SMSing a contact, visiting a Location, visiting a Website, and emailing a contact. You can customize the heck out of this app too, with settings for everything from the paper used in its theme to sorting and display options that make any other todo task manager look weak in comparison. Todo also has support for GTD tasking with context and tag functionality built in. In my tests I downloaded the app, grabbed the Mac app Appgio Sycn (beta version) that supports syncing with iCal, and set it up in a few minutes. Some of the built in sample tasks got into my iCal in a snap. Then I deleted them from my Mac and synced again, and snap, they disappeared from the iPad. Added a few tasks in Todo for iPad, and synced, and what do you know they appeared in iCal. Colors you set in iCal for your calendar are honored in Todo for iPad which is pretty cool. The Checklist tasks are pretty neat, like a subcategorized list of todos, but iCal doesn’t’ know what to do with them, and shows them all as individual tasks. Having been a long time Things user on the Mac, I was worried that I would have problems using Todo and Things simultaneously. It all works actually pretty smoothly. So now I can create tasks in Things on the desktop, and sync that with iCal, which can easily be synced with Todo for the iPad. You might ask, why not just use Things for the iPad. Well I haven’t bought that app yet since it costs a bunch. But for now I love the way Todo for iPad works and honestly the way it looks is also a big plus. Some of the other notable settings include the ability to customize priority themes. You can pick from Mac-Style (3 horizontal blue lines), Mac-style / RTM (red/blue/gray lines), Numbers, Shape icons, Toodledo Numbers and Windows-style icons. You can decide how many completed/overdue tasks to show and for how long. There are a bunch of customizable themes built in, but I tend to love the default blue folder look. You can setup alerts to get emailed for tasks and alert sounds too. A focus list in Todo for iPad is where your tasks of the day are shown. You can customize what to show in that list, including starred, subtasks, completed, by priority, by due date, and even filter by custom list. In landscape mode your virtual folder is shown on the right with your tasks and on the left with the main categories: All, Focus, Starred, Inbox and your custom created Lists. Red and blue numbers indicate total and past due tasks easily. The price for now is set at $4.99 which is a bargain, and will go up. Grab Todo for iPad before the price goes up. It’s definitely worth the investment if you’ve been looking for a killer task manager for your iPad. As a side note: The iPhone version of Todo sells for $9.99 in the iTunes App Store. 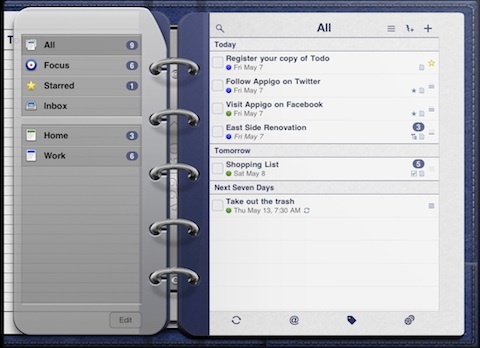 AppSafari review of Todo for iPad was written by Joe Seifi on May 13th, 2010 and categorized under App Store, Calendar, Featured, iPad apps, Notes, Productivity. Page viewed 4580 times, 1 so far today. Need help on using these apps? Please read the Help Page.